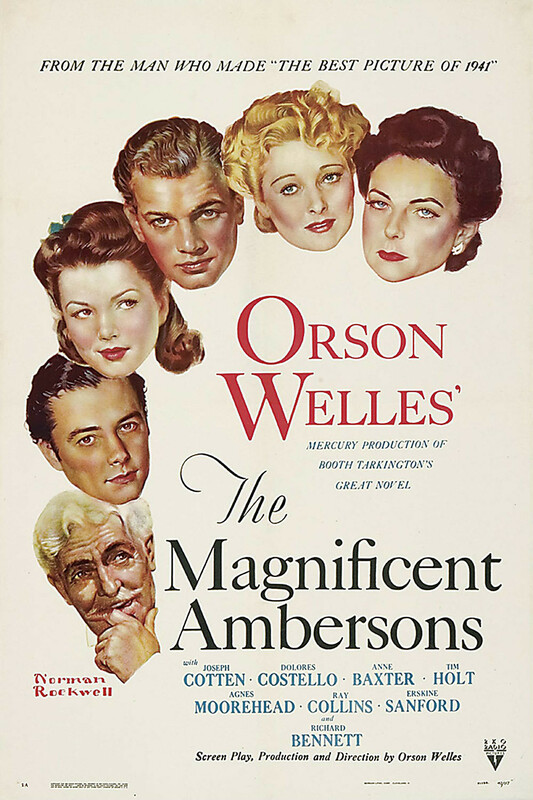 With a sincere bitterness, Orson Welles got his Either/Or moment upon the release of 1942’s The Magnificent Ambersons. Welles, most widely known for his 1941 masterstroke, Citizen Kane, had the opportunity just a year later to curate his mystique by delving into the canonical review of massive tech and social changes around the turn of the last century. Welles, like all of us, like George Amberson Minifer, continued to have an infinite amount of choice, and with either choice or no choice, the choice was wrong. One can be tempted to call this kind of distinction fate, but instead it seems like inevitability. …then, that the world goes from bad to worse, and that its evils increase more and more, as boredom increases, as boredom is the root of all evil. Unfortunately, this sort of proliferation of boredom and mediocrity also haunted the release of this film. The studio should have given Welles free reign over this film, owing to the critical reception of Citizen Kane a year before. Instead, the film’s production team, bogged down with delay after delay and hurried along by a financial bureaucrat, cut and rewrote most of this film against Welles’ wishes. The film studio, RKO, determined by All Powerful Capitalism, pursuit of which is tiresome and boring in itself, needed to ensure a box office success, and at the expense of artistic vision. Welles had no choice in the matter – or did he? My either/or does not in the first instance denote the choice between good and evil, it denotes the choices whereby one chooses good and evil/or excludes them. Here the question is under what determinants one would contemplate the whole of existence and would himself live….It is, therefore, not so much a question of choosing between willing the good or the evil, as of choosing to will, but by this in turn the good and the evil are posited. In context, does he mean that he doesn’t have the choice to make a good or evil choice, that this choice is predetermined by nature/nurture, or that if one has to make a choice, that he doesn’t choose at all his ethos, but rather only the pathos? Was George Amberson, like Orson Welles and Søren Kierkegaard (and really every human), limited to choices made on his behalf. The fleeting feeling of control that limited the release of The Magnificent Ambersons to a farce – and that it’s still considered a top film of all time – is astounding inasmuch as RKO had a choice to choose good or evil and instead chose mediocrity. So what does Orson Welles, a visionary and purveyor of the American spirit choose? His choice of aesthetic and artistic pursuit instead of monetary left him as an industry outsider for much of the remainder of his career. With 40 minutes of his version cut (maybe rightly, maybe wrongly), The Magnificent Ambersons suffered from Either/Or as much as any of its hands did. Two years before the Academy scaled back its Best Picture nominations, The Magnificent Ambersons rounded out a list of 10 films nominated in 1942 – with the eventual winner, Mrs. Miniver, most likely deserving of the award because of its WWII ethos. The year also included Gary Cooper’s magnificent performance in Pride of the Yankees, the film most recognizable from this year to a casual film enthusiast. The year came down to a choice between some caricature of realism and war propaganda, and we know how this choice is likely to play out.